Bad news for the users of the CCleaner app, according to researchers with Cisco Talos, version 5.33 that was available for download between August 15 and September 12 was modified to include the Floxif malware. The Floxif malware downloader is used to gathers information (computer name, a list of installed applications, a list of running processes, MAC addresses for the first three network interfaces) about infected systems and to download and run other malicious binaries. The variant of Floxif malware spread by the crooks only works on 32-bit systems and victims must use an administrator account. 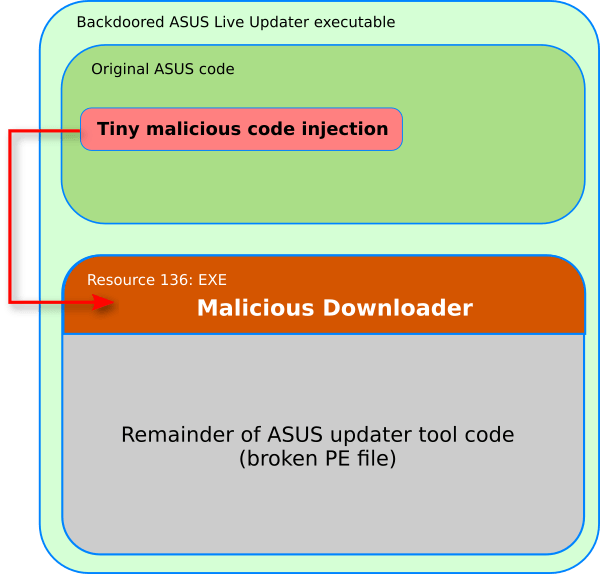 “For a period of time, the legitimate signed version of CCleaner 5.33 being distributed by Avast also contained a multi-stage malware payload that rode on top of the installation of CCleaner.” reads the analysis published by Cisco Talos. “CCleaner boasted over 2 billion total downloads by November of 2016 with a growth rate of 5 million additional users per week. Given the potential damage that could be caused by a network of infected computers even a tiny fraction of this size we decided to move quickly” states the analysis published by Cisco Talos. Cisco Talos experts spotted the trojanized CCleaner app last week while performing beta testing of a new exploit detection solution, they noticed that a version of CCleaner 5.33 was connecting to suspicious domains. later discovered that the CCleaner installer was downloaded from the official website and was signed using a valid digital certificate. Further investigation allowed Talos to discover that the tainted CCleaner version was deployed on the official website and was signed using a valid digital certificate. Researchers speculate attackers have compromised the Avast’s supply chain to spread the Floxif trojan. It is possible that attackers compromised the company system, but experts haven’t excluded that the incident was an insider’s job. “Given the presence of this compilation artifact as well as the fact that the binary was digitally signed using a valid certificate issued to the software developer, it is likely that an external attacker compromised a portion of their development or build environment and leveraged that access to insert malware into the CCleaner build that was released and hosted by the organization. It is also possible that an insider with access to either the development or build environments within the organization intentionally included the malicious code or could have had an account (or similar) compromised which allowed an attacker to include the code.” continues Talos. Let’s remind that Avast owns Piriform that developed the CCleaner solution, the Antivirus solution firm bought it in July, a month before the tainted CCleaner 5.33 version was released. On September 13, Piriform released a new version of the CCleaner (5.34) and CCleaner Cloud version 1.07.3191 that do not contain the malware. “Based on further analysis, we found that the 5.33.6162 version of CCleaner and the 1.07.3191 version of CCleaner Cloud was illegally modified before it was released to the public, and we started an investigation process. We also immediately contacted law enforcement units and worked with them on resolving the issue.” reads a blog post published by Piriform. The Floxif trojan leverage the DGA algorithm to randomly generated domains names used as command and control (C&C) servers. The DNS data revealed that DNS requests for the domain names used in August and September show thousands of users were infected. Once informed of the incident Avast took down the C&C servers and observed a spike in the number of infected hosts making DNS queries for a backup domain. It is important to highlight that updating to version 5.34 does not solve the situation because the malware will be still present on infected hosts.